Fox News host Pete Hegseth has confessed on air that he has not washed his hands for 10 years because “germs are not a real thing”. Speaking on Fox and Friends, Hegseth said the infectious micro-organisms did not exist because they could not be seen with the naked eye. “I inoculate myself,” added the Harvard and Princeton graduate. His confession came after co-hosts Ed Henry and Jedediah Bila made fun of him for eating left-over pizza. 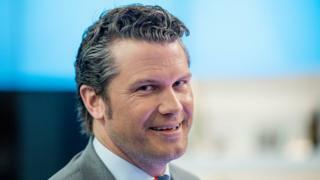 “My 2019 resolution is to say things on air that I say off air,” Hegseth added. His comments were met with both support and concern on social media. The US-based Centers for Disease Control and Prevention says regular hand washing “is one of the best ways to remove germs, avoid getting sick, and prevent the spread of germs to others”. According to a scientific study published by the US National Center for Biotechnology Information, one gram (0.03oz) of human faeces – about the weight of a paper clip – can contain one trillion germs. Bacteria that can be spread by unwashed hands include salmonella and E coli. US President Donald Trump – who has given more interviews to Fox than any other major network – has admitted on several occasions to being a germophobe. In his 1997 book, The Art of the Comeback, Mr Trump wrote: “One of the curses of American society is the simple act of shaking hands, and the more successful and famous one becomes the worse this terrible custom seems to get.